Last June I started a journey (read about it here). In the 10 months that have passed since then many things have changed. Probably the most noticeable is my 38lb weight loss. June of last year I was a 173lb size 12 and as of this morning I am a 135lb comfortable size 4. SIZE 4! If I may for just a minute…I have never in my life been a size 4!!! I would like to say it was easy…but I can’t. I can say that it is possible, and my brain was ready for the change my body so desperately needed. I am excited to share how I did it too, I feel like I struck gold. This is so cheesy but it’s true what they say “Nothing tastes as good as skinny feels” But I’d like to change that a bit to “Nothing tastes as good as being healthy feels!” In the end it’s not about what the scale says, it’s about your health and how your feel. I started my very successful weight loss with calorie counting. It is as easy or as complicated as you make it. First you need to calculate your Basal Metabolic Rate or BMR. This will help figure out how many calories you need to consume (or not) to lose weight. This website is also a great diet and exercise info source. There are also a million sites that calculate, track and log calories for you, applications for your phone, and then the tried and true side of the box + note book and pen. I use an application for my phone called LoseIt, it has a massive data base of foods including specific brands and restaurants. You can log what you eat, it keeps track so all you have to do is check back to see where you’re at. You can also log your exercise and it will subtract that from your calories used-more you exercise the more you can eat! It also creates a weight loss plan for you estimating the calories you need to insure weight loss. I like to keep things simple, so I looked at the the foods I like to eat and looked for ways to modify them to fit into my calorie set. To start with there are just some foods that weren’t worth it for me…like cheese. The calories verse portion size just wasn’t worth it. I also got myself some measuring cups. Ok it might seem insane to measure your food, but when you have a seriously dysfunctional relationship with it, it’s very necessary. So what did I start my calorie counting with…Quaker Oats Old Fashioned Oatmeal Two Bag 110 Plus Serving Mega Value Box for breakfast. Fruits and veggies as snacks. Lunch was either a small can of Chicken of the Sea Tuna Chunk Light Water, 3 Ounce Tins (Pack of 24) (with mustard and relish) with Ak-Mak Sesame Crackers, 4.15-Ounce Boxes (Pack of 12) or turkey on a Arnold Select Sandwich Thins Multi-Grain 12 oz (Pack of 4) and fruit. Then I would just eat whatever I was making for the family for dinner and modify it to fit my calories. There are also plenty of 100 Calorie Packs Mr. Salty Chocolate Covered Pretzels, 4.68-Ounce Boxes (Pack of 6) snacks and desserts these days so you don’t feel deprived. The first 10lbs fell off, and so did the next 10. Then I hit a plateau. This is getting pretty long and I have so much more to share so I think I’ll do a little at a time. End of weight talk for now. The family is doing wonderful. The boys are about done with school for this year and we just started sports again. Lennox is playing T-ball and really loving it! Aidan was too young so we signed him up for soccer, and so far he’s pretty awesome at it. Goals coming out of his eye balls! Both boys are thriving in school, two very eager learners. Next year all the kids will be in school of some kind or another…the girls will be going to pre-school. They are so ready. Cora is counting to 10 and they’ve just about got all their letters. Smart cookies those two! Last weekend we had everyone up for Easter and a friend who happens to be a great professional photographer came over and took some family portraits for us. 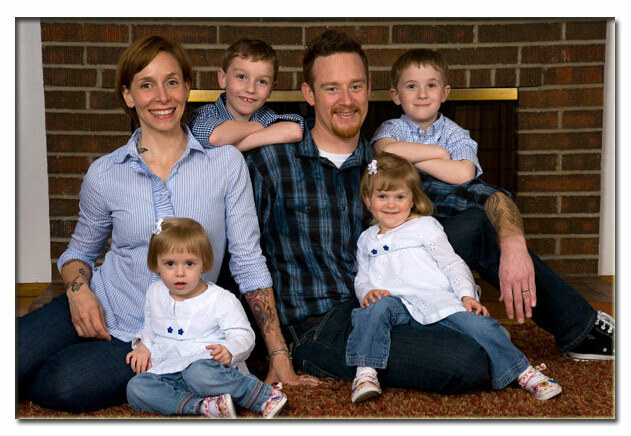 The last family portrait we had done, Madi was the only kid in our now very large family. The pictures came out beautifully and we are so Thankful to David! He did an amazing job.